Priyanka Gandhi Vadra on Monday kick-started a poll campaign for upcoming Lok Sabha elections from the banks of river Ganga in Prayagraj and will embark upon a 140 km ‘Ganga-yatra’ to Varanasi. Congress General Secretary for UP-East Priyanka Gandhi launched ‘chowkidar’ attack on Prime Minister Narendra Modi's "Main Bhi Chowkidar" campaign. Priyanka Gandhi Vadra while addressing local people during her boat ride on the Ganga said "Chowkidars are for the rich, not farmers." “Unki (Prime Minister) marzi apne naam ke aage kya lagaen. Mujhe ek kisan bhai ne kaha ki 'dekhiye chowkidaar to ameeron ke hote hain, hum kisan to apne khud chowkidaar hote hain ("Yesterday I met with a group of farmers... The potato farmers of western IP. One of the farmers told me, chowkidars are for the rich. We farmers are our own chowkidars),” news agency ANI quoted saying, Priyanka Gandhi. 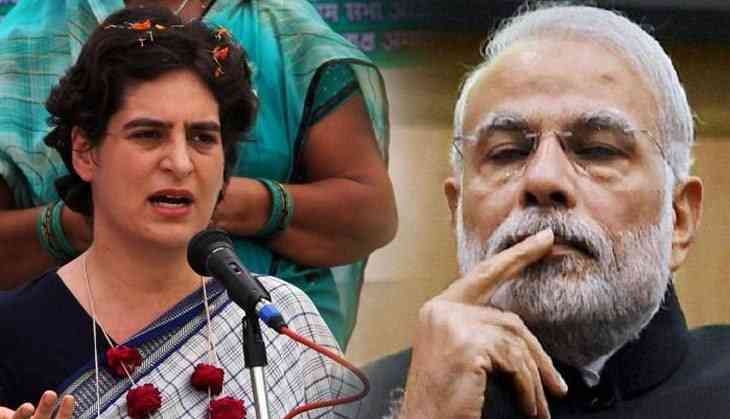 The three-day boat campaign will witness Priyanka Gandhi travel from Prayagraj to Varanasi, PM Narendra Modi's constituency while making halt at various places in between. In an open letter, Priyanka Gandhi has yesterday said that “Ganga is the symbol of truth, Ganga Jamuni culture. It does not distinguish. Ganga is the lifeline of Uttar Pradesh and taking the support of Ganga, I will also reach you.” Priyanka Gandhi reached Lucknow on Sunday evening and met the delegations along with the party office bearer.